Body Movement in Automobile Crashes — How Do Injuries Occur in a Maryland Auto Accident? Even with the technological advances that make automobiles safer today than ever before, people who are involved in an accident often suffer bodily injuries. In some cases, it is the safety features, such as seatbelts and airbags, which contribute to the injuries suffered in a car crash. Understanding what happens to our bodies during a car crash can help us understand why we are injured in a car crash. The Maryland personal injury lawyers of Pinder Plotkin, LLC represent accident victims who have been injured because of the negligence of another driver. Call 410-661-9440 for a free consultation and no-obligation case evaluation. What Happens During the Initial Impact? Most people assume that an automobile accident involves only one impact — the vehicle with another object. However, the vehicle impact is only the first impact that occurs during a car crash. Because of the force of the collision, your body can collide with something in the vehicle, such as the steering wheel, windshield, or dashboard. In addition, the airbags, seatbelt, and objects in the car are also potential sources of impact for your body. Also, upon the vehicle’s impact, your organs can shift and collide with the supporting structure of your body. For instance, your brain can move within your skull colliding with the hard bone structure. Your internal organs within your torso can collide with your ribs, pelvis, spine, or sternum. As soft tissue collides with harder surfaces, injuries can occur. Therefore, as the impact of the collision causes your body to move within the vehicle, several injuries can occur. The type of accident can influence how your body moves within the vehicle and the injuries that result from the crash. 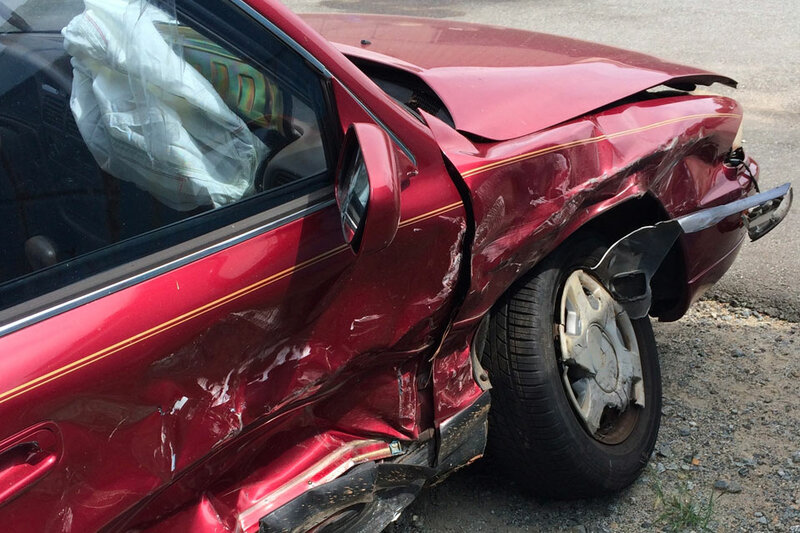 Rear-end crashes commonly cause injuries to the neck, chest, head, and spine. The whiplash effect of your head and upper body being jerked forward and backward violently from the rear impact crash causes hyperextension of soft tissues in the neck. Whiplash is one of the most common injuries in a rear-end collision. Even though insurance companies play down the long-term effects of whiplash, this type of car accident injury can cause chronic pain and limited mobility making it difficult to work and perform other tasks. In some cases, a permanent disability may result from whiplash. When your vehicle is hit from the front, you can also suffer whiplash from the motion of being jerked forward and backward violently. However, most injuries from front-end crashes occur from your body’s impact with objects in the car, such as the steering wheel, dashboard, or windshield. In addition, the impact of being struck can cause the vehicle to crumple and crush the person’s torso and lower extremities. Occupants wearing seatbelts can suffer internal injuries from being restrained in a head-on collision. However, occupants who are not wearing a seatbelt often suffer severe head and facial injuries from colliding with objects in the vehicle. When another vehicle crashes into the side of your car, the impact can cause some of the same injuries because your body is violently thrown to the side and jerked backward. However, there is also the threat that the collision will cause the intrusion of parts of the car into the passenger area. When parts of the vehicle intrude into the occupant’s space, those parts can cause injuries as well. The bottom line is that our bodies are fragile compared to a vehicle. A vehicle is made to withstand an impact with another vehicle or object. However, our bodies are simply not constructed to withstand that type of impact with another object. In addition, our internal organs and structure do not withstand the severe and traumatic jerking motion that occurs when our vehicle collides with another object or vehicle. Therefore, you can suffer severe and life-altering injuries in any motor vehicle accident, even a low-impact accident. It is important to seek medical attention after any car accident. You could have suffered an injury that you may not be aware of immediately that could become worse without medical intervention. If another person caused your automobile accident, you might be entitled to compensation for your injuries, damages, and losses. Our Maryland personal injury lawyers can help you file an accident claim to recover money for your damages. For a free consultation with a Maryland car accident attorney, contact Pinder Plotkin LLC at 410-661-9440.